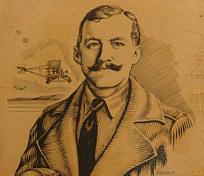 Lt. George E. M. Kelly was an immigrant from London, who enlisted in the U.S. Army and after a time was commissioned as an officer. After volunteering for the Air Service. 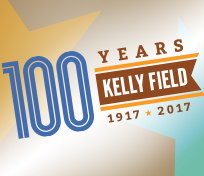 Kelly Field has a rich history as a thriving center of human activity—reflecting the present day work that takes place at the site to support the surrounding community’s growth and connecting it to the world. This website is a tribute to that heritage. Port San Antonio wishes to thank everyone whose works and insights have been instrumental to the development of the Kelly Heritage site. While the historic chronology of Kelly Air Force Base is principally based on research conducted by the San Antonio Air Logistics Center Office of History, footnotes are utilized to denote additional resources. As a result of each researcher’s passion for preserving the legacy of Kelly Field and its surrounding neighborhoods, the historical importance of the former Air Force Base will resonate soundly with future generations to come.